I come to you from the "other" lake where I taught 7th grade Mathematics. Horn Lake Middle and Horn Lake High was home to me for a total of 10 years and I was proud to call myself an Eagle! I was named Teacher of the Year for the 2010-2011 and 2016-2017 school years, and I will miss my students and colleagues dearly. However, I look forward to making many great memories at my new "lake" home, and I am even more proud to now call myself a Gator!! I received my B.A. from The University of Mississippi in 2002 and my M.S. in Curriculum, Instruction, and Assessment from Walden University in 2008. I received my Ed.S. in Leadership from Arkansas State University. I have worked in Desoto County Schools for a total of 14 years and look forward to many more. 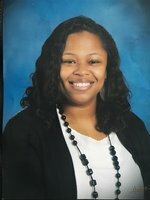 I am licensed and highly qualified in the State of Mississippi to teach Math (7-12), English (7-12), Social Studies (7-12), Middle School Math (7-8), and Mild/Moderate Disabilities (K-12). I live in Hernando with my husband Deljuan and our 3 daughters Caylar (14), Charlotte (5), and Corinne (3).